Aspen Yellow Tone SuperLEAF 1-Gallon SuperPak! The IDEAL product to compliment SuperTrees! A multi-dimensional aspen yellow leaf flake which gives volume to foliages and provides highlights and shadows on tree branches, shrubbery, vines and leaves. Aspen Yellow SuperLEAF 16oz. Shaker! The bright yellow of Quaking Aspens in their "high glory". Approximately 2 cups of leaves. Similar to Noch's NH07148. Aspen Yellow SuperLEAF 24 oz. ECO-Pak! Great for adding a touch of sun highlight to any tree, excellent for fall tones, and don't forget the bright yellow tone of quaking aspen trees at their full autum glory! Crabapple Leaf Petals 1-Gallon SuperPak! For those layouts in need of lots of premier leafy trees - available in 1-gallon super-size bag! Crabapple Leaf Petals! Available in a handy 16oz. (by volume) jar sealed with a plastic cap which provides two options for either spooning the leaves or shaking. Approximately 2 cups of leaves. Crabapple Leaf Petals ECO-Paks! If you're tired of all the plastic jars and are "ECOnomically FRIENDLY", our NEW 24oz. (by volume) bag of SuperLEAFS are the ticket! Approximately 3 cups of leaves. Thats 8oz. MORE than the Shaker Bottles for the same price! Dark Green SuperLEAF - 24oz. ECO-Paks! The real color for dark green leaf and/or plant foliage. May also be used for leafy vegetable plants and ground coverings. Dark Green Tone SuperLEAF 1-Gallon SuperPak! For those layouts in need of lots of premier leafy trees - available in 1-gallon super-size bag! (Scenic Express' NEW SuperLEAF Dark Green color similar to Noch Dark Green Leaf Flake Flock NH07146 /NH07152). Dark Green Tone SuperLEAF 16oz. Shaker! Available in a handy 16oz. refillable shaker (by volume) sealed with a convenient Shaker-Spoon Cap. Approximately 2 cups of leaves. Eucalyptus SuperLEAF 1-Gallon SuperPak! As our tree flora flocking materials are vast, we are frequently asked "Where's the Eucalyptus"? Well, for all you modelers in search of the Eucalyptus and 'Gum Trees' - This One's For You! For those layouts in need of lots of premier leafy trees - available in 1-gallon super-size bag! Eucalyptus Green SuperLEAF 16oz. Shaker! As our tree flora flocking materials are vast, we are frequently asked "Where's the Eucalyptus"? Well, for all you modelers in search of the Eucalyptus and 'Gum Trees' - This One's For You! 16oz. refillable jar (by volume) sealed with a convenient Shaker-Spoon Cap. Approximately 2 cups of leaves (by volume). Eucalyptus SuperLEAF 24oz. ECO-Pak! As our tree flora flocking materials are vast, we are frequently asked "Where's the Eucalyptus"? Well, for all you modelers in search of the Eucalyptus and 'Gum Trees' - This One's For You! Now in our NEW 24oz. (by volume) ECO-Pak! Approximately 3 cups of leaves. Thats 8oz. MORE for the same price! 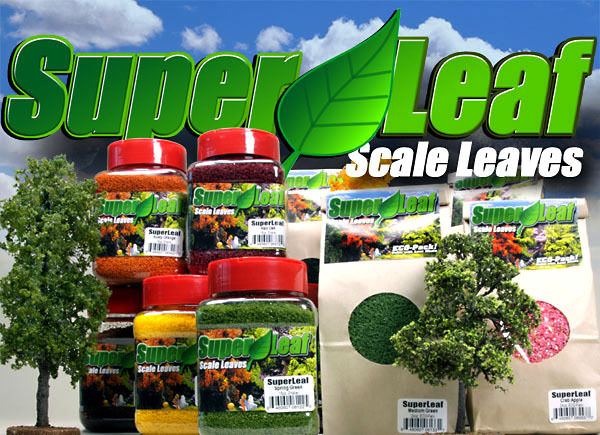 Fall Leaf SuperLEAF 16oz. Shaker! Ideal Leaf-Litter!! Scatter under trees, roof-tops and forest ground coverings! Japanese Cherry Leaf Petals! Available in a handy 16oz. (by volume) jar sealed with a plastic cap which provides two options for either spooning the leaves or shaking. Approximately 2 cups of leaves. Japanese Cherry ECO-Paks! If your tired of all the plastic jars and are "ECO-FRIENDLY", our NEW 24oz. (by volume) bag of SuperLEAFS are the ticket! Approximately 3 cups of leaves. Thats 8oz. MORE for the same price!